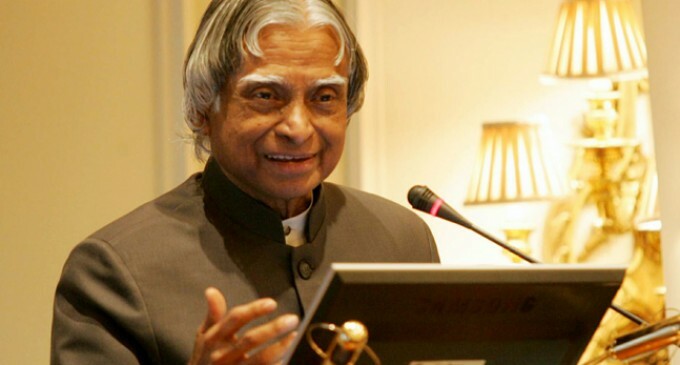 In great news for India, scientists at NASA have named a new organism discovered by them after the much-loved A P J Abdul Kalam. Till date, the new organism — a form of a bacteria — has been found only on the International Space Station (ISS) and has not been found on earth! Researchers at the Jet Propulsion Laboratory (JPL), the foremost lab of NASA for work on inter-planetary travel, discovered the new bacteria on the filters of the International Space Station (ISS) and named it Solibacillus kalamii to honour the late president, who was a renowned aerospace scientist. Kalam had his early training at NASA in 1963 before he set up India’s first rocket-launching facility in the fishing village of Thumba in Kerala. “The name of the bacterium is Solibacillus kalamii, the species name is after Dr Abdul Kalam and genus name is Solibacillus which is a spore forming bacteria,” said Dr Kasthuri Venkateswaran, senior research scientist, Biotechnology and Planetary Protection Group at JPL. The filter on which the new bug was found remained on board the ISS for 40 months. Called a high-efficiency particulate arrestance filter or HEPA filter, this part is the routine housekeeping and cleaning system on board the international space station. This filter was later analysed at JPL and only this year did Venkateswaran publish his discovery in the International Journal of Systematic and Evolutionary Microbiology. According to Venkateswaran, even as it orbits the earth some 400 kilometres above, the ISS is home to many types of bacteria and fungi which co-inhabit the station with the astronauts who live and work on the station. Venkateswaran said even though Solibacillus kalamii has never been found on earth till date, it is really not an extra-terrestrial life form or ET. “I am reasonably sure it has hitch hiked to the space station on board some cargo and then survived the hostile conditions of space,” explained Venkateswaran. Naming the new microbe after Kalam was natural to Venkateswaran and his team. Towards that, his responsibilities include monitoring the bug levels on the ISS and he also has to ensure that all spacecraft that fly to other planets are free of terrestrial bugs. One of his big jobs was to ensure that NASA’s Mars Curiosity rover — the massive car-sized almost 1000 kg buggy — was totally sterile when it left earth. By international law, this extreme hygiene is required else other planets could get contaminated by bugs that reach the Martian or other planets hidden on human satellites. Today the ISS is the size of a football field and its construction started with a launch in 1998 and as of now it is the largest human-made object orbiting the earth. Weighing about 419 tonnes, it can house a maximum of six astronauts and has costs roughly USD 150 billion. Till date, 227 astronauts have flown to the space station. This makes the space station actually a very dirty place and maintaining hygiene is critical so that humans can live on it with ease. On the space station all the air and water is recycled, being a completely closed environment there is a rapid build- up of moulds and bacteria on the station. These not only have to be cleaned but monitored to ensure that they do not corrode the walls of the space station and do not turn hazardous to the astronauts. Venkateswaran’s main job is to monitor the environment of the space station so that harmful bugs do not proliferate. He heads the ‘Microbial Observatory’ on the ISS projects to measure microorganisms associated with compartments owned by the US. According to NASA, he also directs several research and development tasks for the JPL – Mars Program Office, which enables the cleaning, sterilisation, and validation of spacecraft components. He directs several NASA competitive awards on the microbial monitoring of spacecraft and associated environments for the Exploration System Mission Directorate, closed habitats like ISS or its earth analogues for the Human Exploration and Operation Mission Directorate. But is the new bug of some use. “These spore formers tend to withstand high radiation and also produce some useful compounds protein wise which will be helpful for biotechnology applications,” Venkateswaran said. His team has not characterised the bacteria fully but he hints that the new bug could be a key source for chemicals that can help protect against radiation damage.